Mark: Hi, it’s Mark from Top Local Lead Generation. We’re here with Nicole Burke of Emelle’s Catering. 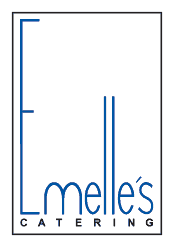 Emelle’s are an award winning catering company in Vancouver. Nicole is their director of pretty much everything. She’s a font of knowledge as you’re going to see, and today we’re going to talk about planning the food. How are you doing today Nicole? Nicole: I’m excellent, Mark, how about yourself today? Mark: I’m good. So, how does Emelle’s plan the food for a wedding or other events? Nicole: Well, you’d think as a caterer it would all be about food, right? We try our best to start you off somewhere so we look at seasonality, we look at the type of event that you’re having, we also look at things that are locally sourced since that’s really important to people, and start you off with a bit of a package. Really most of it is about customization so how can we cater to you, that is in fact our tag line after all. The point really is, if what’s going to make your event special is incorporating those small nuances like grandma’s meatloaf into your wedding or if you’ve got a bigwig client that happens to be a celiac, it’s how we can put those items into the menu plan so that the guests know that’s made especially for them and that’s what’s key. Mark: So customization is really available and does it add a lot to the costs, like how does that work? Nicole: Well interesting that you ask because most hotels, restaurants they do have set menus and it does cost more to customize. That is where catering is awesome because we are only ordering food for the events that we have on that particular day so we’re able to buy specialty produce, add ingredients to things to your taste preference and we do that because we’re only making it for you, we don’t have hundreds of pounds of things sitting in our cooler waiting to be sold, it’s the other side, once we’ve sold it then we bring it. Mark: Perfect. So, seasonality, what would be some examples of how that would change your menu? Nicole: Well, think summertime. Right in Vancouver particularly, it’s all about berries and fresh produce that we can get from Granville Island, we’re not making too many strawberries in Vancouver in January so clearly that’s not going to be a locally sourced product in January and if we are buying it, importing it in that’s going to increase the costs, so in fact, in reality, strawberries can be double the price this time of year than they are in the summertime. So it’s important for us to include those things so that A. the freshness of the product is so much better when we don’t have to ship it and you’re going to actually benefit from buying in season because there’s more supply. Mark: So are there any kind of limits then on the kind of foods that you guys can prepare? Nicole: Absolutely not and that’s what’s fun! So, we have an international team of chef’s here that always like to do different things and that’s what the fun part for us, if someone comes to us with a real special recipe and we can go to the Chinese market and buy special spices to include it then the team gets to learn something new, we’re excited and engaged and when we’re able to deliver that smile to the client at the end, that’s really the reward. Mark: So, if you want excellent food at your next wedding or your next wedding because you have multiples, or your next event, you might not plan ahead for that but at your next event, your corporate event, your big party, your small party, you do small stuff too, right? Nicole: Oh yes, Valentines is coming, how about dinner for two? So absolutely, two people, two thousand people and everything in between, we’re happy to cater to everybody. Mark: These are the guys to call, Emelle’s catering. Give Nicole a call 604-875-6551 or check out their website emellescatering.com. Thanks Nicole. Nicole: You’re welcome Mark, have a great day.